Riding with a pillion is something that you won’t practice much until you get a passenger on the back of your motorcycle. It’s not one of the aspects of the CBT and you won’t get assessed on your passenger-carrying ability on any of your motorbike tests either. However it’s something that should be worked at because a pillion passenger will change the way your bike handles and feels. Adding a pillion – what changes? Obviously, another body on your motorbike means a change in the weight it’s carrying and also how it’s distributed. Bikes are manufactured so that when you sit on them, your weight distribution is suited to the motorcycle’s design but when you take a passenger on board, that dynamic is changed. Usually that means there is more weight over the back wheel, which can make riding different, even difficult. While your bike will be able to cope with this change in weight distribution (if it has two sets of pegs and is suitable for passengers) it will feel different to ride. The added weight will also have an effect on the performance of your motorbike. Braking distances will be longer and acceleration will be slower. 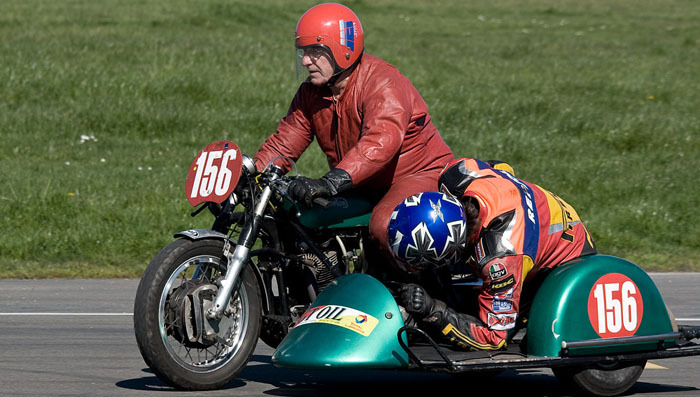 Will my bike cope with the added weight of a pillion? If your motorcycle has a seat suitable for two passengers, as well as rear foot pegs, then it will be able to handle a passenger. What it might not be is comfortable for the passenger however as long as you avoid a sports bike your machine should be well suited to carrying passengers. Should I adjust my bike to cope with a pillion? You can make a number of minor changes to your bike’s set-up to minimise the impact a passenger will have. At the back, you should stiffen the rear shock’s spring pre-load to cope with the extra weight a passenger adds. This will help reduce the impact of a passenger on steering and maintain decent ground clearance. At the front you should try to reduce the fork drive. This means when you brake, your weight, plus the passenger’s, will not drive the suspension all the way to the bottom. What motorcycle should I buy for a pillion? As mentioned, it’s only sports bikes that have little or no regard for pillions in their design and set-up. Tourers and cruisers will be designed, to a certain extent, with the passenger in mind. That means they will be more comfortable for pillions and their engines will be more able to provide mid-range gr unt to deal with the extra weight. Your pillion won’t affect steering and riding ergonomics as much on these kinds of bikes, unlike sports bikes! Should I change my riding style with a pillion? Your riding style will change with a pillion on the back, or it should anyway. Braking distances are lengthened and acceleration is slower so your anticipation must be sharp to cope with these changes. Turning will also change with a passenger on board as there is more weight to cope with and your motorcycle will feel more cumbersome. What should a pillion wear? Just because a passenger isn’t driving doesn’t mean their importance is any less, nor does it mean they are at less risk. Their safety is just as important as the driver’s so that means they need a good-fitting helmet and leathers or clothing designed to cope with the stresses and strains of riding. Lots of riders will confess to dumping their bike after an over exuberant passenger has jumped on and caught them unawares. As a pillion you should let the rider get on their bike and get ready to move off before you hop on. You should also let the rider know that you are about to get on so that they can brace themselves. Then it’s over to you. Access from the left hand side and place your left foot on the foot peg. Swing your right leg up and over the bike and rest it on the foot peg. Get yourself settled and comfortable, grabbing the rail or the rider, before telling the rider you’re good to go. Don’t let the rider set off if you are not comfortable or ready. There is nothing more annoying and disconcerting than a pillion shifting and wriggling about behind you when you’re on the road. Where should a pillion hold on? There’s no definitive answer to this and it all depends on the passenger and the rider. If you’re not comfortable with a passenger holding on to your waist or they’re not keen about the grab rails at the back then you can buy specially designed pillion belts. It’s worth trying out all the options until you get a solution that both rider and passenger feel comfortable with. If I’m a pillion, can I talk to the rider? Communication between rider and pillion is vital for safe and enjoyable riding. Before you set off you should discuss different ways of communicating with the rider. Use hand signals or touches to signify a desire to stop or slow down. Similarly, being a passenger is easier if you know what the rider intends to do. The rider should therefore let his passenger know when they’re about to accelerate or turn; again, hand signals and gestures are useful. Can I move about as a pillion? As mentioned, the riding dynamics of a motorbike are already changed by the addition of a passenger. This makes riding different and potentially more difficult for a rider – moving about just exaggerates that. If you’re uncomfortable you should let the rider know that you want to rearrange yourself and it is then up to them whether you do this when you’re stationary or on the move. If you need to change position when moving you should do so by evenly distributing your weight on both foot pegs and you should give a warning to prevent any unnecessary wobbles. Should a pillion lean when a rider does? Pillions should lean with the rider but this shouldn’t be excessive. If you lean too far, the added weight of two riders leaning over may result in you hitting the tarmac. The same goes for underleaning. This could prevent the bike from making its turn as the weight is mismatched. The best technique is to stay relaxed and lean naturally with the bike. Being a pillion isn’t easy and it can be a nerve-wracking experience for anyone who’s never done it before. Therefore you should hold back on the speed and try to ride as smoothly as possible. Not only will this make your passenger feel more comfortable, it will also stop them from rocking backwards and forwards when you accelerate and brake, something which can result in headbutts. 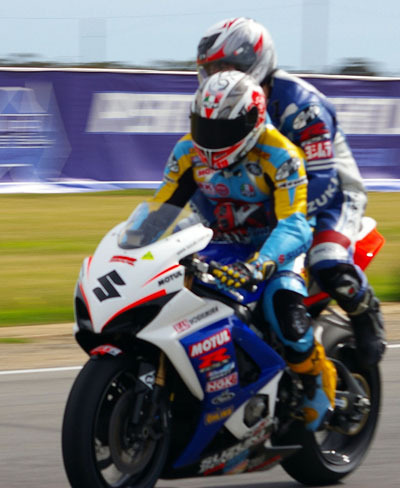 Images courtesy of Australian Superbikes and Scott Symonds via Creative Commons and have been adapted.